One of the great features of the Commodore Amiga computer was that it's graphical user interface Workbench would automatically create an icon on the desktop whenever a disk was inserted into the drive. Floppy disks are not the medium of choice anymore but the feature itself would still be extremely useful for quickly accessing removable storage devices such as USB Drives, CD-Roms or sticks. Windows by default displays a dialog window if a new storage device is connected to the PC or a CD or DVD inserted into the optical drive. The Windows user can select a default action that gets executed automatically from then on but there is no option to place a drive shortcut on the desktop. 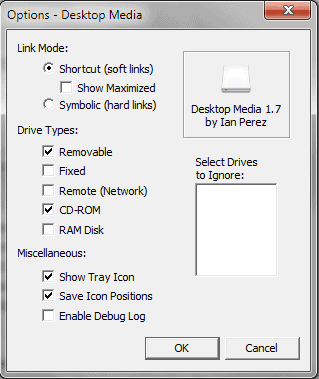 Desktop Media is a lightweight program for Windows that can be used for exactly this purpose. The software supports removable, fixed and remote drives as well as CD-ROMs and ram disks. All drive types can be enabled or disabled in the program's options. There is also an option to select specific drives that should be ignored by Desktop Media so that no drive shortcut is created when it is connected to the computer system. Drive icons are only placed on the desktop if a removable drive is connected to the PC or a disk is inserted into the CD-Rom drive. Shortcut links are displayed on the desktop by default. This can be changed to symbolic links which changes the way the link behaves. A shortcut basically points to the connected drive or disk while the symbolic links behaves as if the storage device or disk where located on the desktop. Drive and disk icons are only added to the desktop if the drive is connected or a disk is inserted. The program will for instance create no shortcut for an empty CD-Rom drive on the computer desktop. Four additional options can be selected in the options. Show Maximized will maximize shortcut windows whenever they are opened, this is an automatic process. Show Tray icon displays the Desktop Media tray icon, save icon positions ensures that the icons will always be placed at the same location on the computer desktop and enable debug log will write debugging information. Desktop Media is an excellent free program for the Windows operating system. It has a small memory footprint and can be downloaded directly from the developer's website. Been using this app for a year or two. It runs great and uses little resources (~3MB).